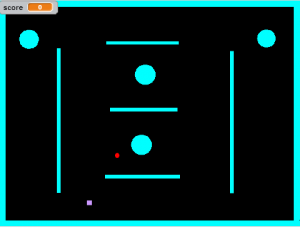 Last time in the Scratch unit, we made a game, and now we’re making a recreated film! In this project, we’re going to make a very short film or a condensed form of a movie. The movie was so good and beautiful! I chose this movie because it left a very powerful thought and feeling to me. As I said, it was very beautiful and dramatic. It really inspired me. Like no matter how many times I watch this movie, I will still think that it’s beautiful. It leaves us many lessons. When I watched the animated film, I felt happiness, sadness, pain and also anger. Moving on about that, I’ve made this short film by some Scratch skills I learnt from the previous Scratch Game project. Like the events where if you click or press a certain button, something will happen. Also, in the control unit where I placed a block where you have to wait for seconds for something to happen. And also, about switching the sprite costume or the background. While recreating this film, I learnt how to broadcast a message and to receive a message through sprites. Broadcasting was the one that made my film continue playing. And that’s all. Go here to see the actual project. 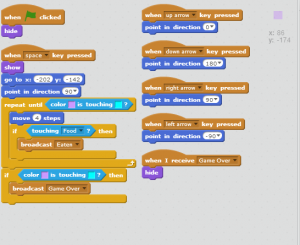 So, in this post we will talk about what I learned from creating a game in Scratch and other things. Movements ─ I learned about how to move a sprite in one place to another. Examples are gliding, walking, moving, randomly moving a sprite from one place to another. Looks / Costumes ─ I learned how to change the sprite’s costumes. Also, changing the background of the game. Sounds ─ I also learned how to put sounds on the game. Like when you pop something in the game, I can put a ‘popping’ sound when that happens. 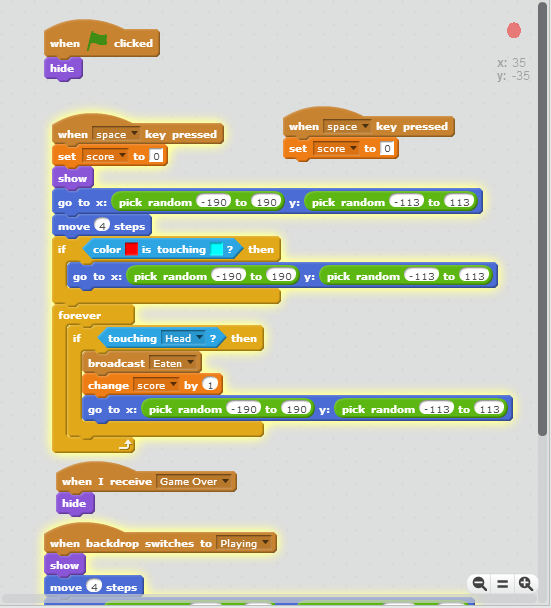 Variables / Data ─ This was the hardest part of using Scratch. The purpose of this function is the constantly moving variables such as time, score, etc. 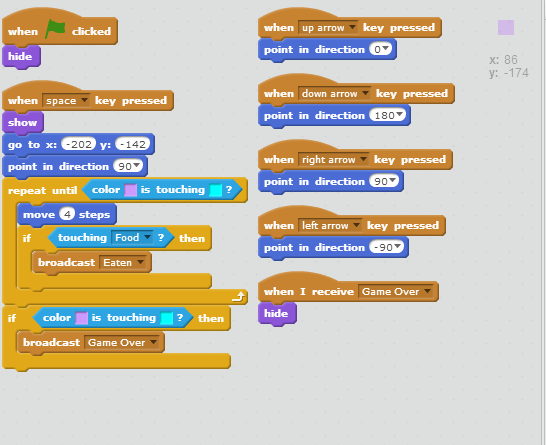 Events / Controls / Sensing / Operators ─ This part of using the Scratch is rather easy. It’s easy to understand since these functions are easy to use. The events is for something like the key to make a script function. The control is just as it says, it’s the controller of the script, example is when you want to repeat something. Sensing is like the controls but is different in a way, for example, if you want something to happen when the A sprite touched the B sprite, sensing is the function you’ll want to use. 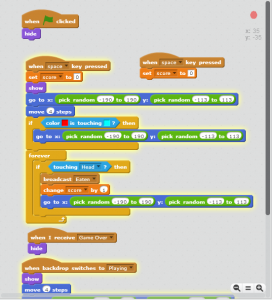 Operators are used for scripts of math equations and handling strings, they can connect two or more blocks if needed. Lastly, we’re going to talk about how I made the game. Firstly, I made 6 sprites, the purple box that you control, the red dots that you want to get, and the light blue debris that you nee to avoid. Then, I made 3 backgrounds. First is the background before you play the game, second is when you’re playing the game and last is when you lose. 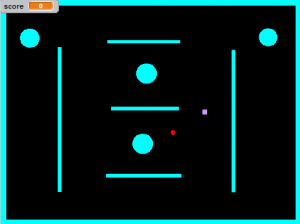 After that, I added some blocks to the purple box to make it move around using the arrow keys. Then, I added some blocks to the red dot to make it appear randomly within the game and score one every time it bumps to the purple box. Lastly is the light blue debris, I added some blocks to it where every time the purple box bumped into it, the background will change to the ‘lose’ one and the game is over. It is still faulty cause the red dot could also appear at the debris.